In 2002, the DCI World Championships returned to Madison, Wis., with events for the Division II & III corps held a half hour away in Whitewater, where it all started for Drum Corps International exactly 30 years earlier. Special anniversary events in Madison included a performance of memorable moments from DCI history, done in shadow dance fashion behind giant backlit scrims by members of the Santa Clara Vanguard Alumni Corps. The Cavaliers completed an undefeated season with a record high score less than a point shy a perfect score. 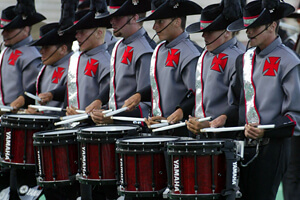 The corps' "Frameworks" production won all captions but Music Percussion. With scores tight across all three nights of competition, three corps made it into the Finals that were not there in 2001: Spirit of Atlanta regained a top-12 position for the first time since 1990, Magic of Orlando roared back for the first time since 1997, and the Seattle Cascades captured 12th place after competing as a Division II unit in 2001. Crossmen's 9th place show, "The Signature Series," was based on a collection of selections written by great jazz artists within the quarter century prior to 2002. "Heat of the Day," by Lyle Mays and Pat Metheny, was from Metheny's "Imaginary Day" album, fusing international and American jazz styles. It was the winner of the 1999 Grammy Award for Best Contemporary Jazz Album. For the opening segment, the Crossmen horn line was entirely inside the tunnel at the back right corner of Camp Randall Stadium, pouring out once the piece began and executing a variety of line formations along the way. The color guard members, who were dressed entirely in flaming reddish-orange with long flowing tops that draped beneath the knees, danced while the percussion keyboards, timpani and stationary snare drummers on hi-hat cymbals played the opening groove in the front ensemble. From there, the work proceeded through a multitude of time signatures offering hints of Middle Eastern folk music. The melodic "hook" was more of a persistent rhythm than a typical musical line. Near the climax, the brass section formed the corps' trademark Maltese Cross, as identifiable to the Crossmen as any formation is to any other unit. "Candle in the Window" was from the 1999 musical, "The Civil War," which ran on Broadway for just five weeks. Frank Wildhorn, who may be best known for writing the music for "Jekyll & Hyde" and Whitney Houston's "Where Do Broken Hearts Go?" composed it. The gorgeous ballad, originally sung by Linda Eder, provided the color guard with a center-stage focus to unleash some searing passion with large blue flags of darkening hues. Several brass players were also worked into the choreography in the early moments. The final piece in the show was arguably Don Ellis' most famous work, "Strawberry Soup," from the1971 album, "Tears of Joy." Originally almost 18 minutes long, the piece has at times been referred to as a big band concerto. However, the big band Ellis wrote it for, one of the adventurous incarnations of his own ensemble, was hardly a big band in the traditional sense. It had multiple drum sets, a French Horn and a string section. Metrically intricate, "Strawberry Soup" has also been referred to as "schizophrenic" due to the ease with which it moves between a wide variety of moods. Crossmen embraced this musical schizophrenia, freely moving between the different styles. Strawberry red flags were brought out to contrast the color guard costumes, still red on the bottom. After removing long red covers, the guard basked in the glow of luminous yellow tank tops. Leading up to the rollicking swing section, horns and drums demonstrated equal comfort with the conflicting styles of the piece. Bright yellow flags were brought out for the final half-minute of the show, visually unleashing the heat of the day on the waning hours of the night. For this week only, you can save on the DVD that contains this complete Crossmen performance, along with all of finalists corps at the 2002 DCI World Championship. Buy the 2002 World Championship DVD set. (Available this week only for 20% off. Regular price: $45.95.) Discount DVD offer ends Monday, March 18 at 8:30 a.m. ET.